The weather was predicted to be the same temperature as yesterday’s race, but I wasn’t going to be fooled. And I was right. Because of the clear night sky overnight, I was quite chilly in the start corral with my sleeves and headband on. At gear drop off for the previous day’s half marathon I knew I wouldn’t need the sleeves even though there was a slight chill in the air. Today, however, I kept them with me! First hill of the race! I had to pause to get a picture of this. The streets of SF are so dead on Sunday mornings. It was almost eerie. Also, the run crowd for this race were not talkers. Usually there are little conversations going on and there’s a low hum of noise, but this crowd was quiet for the WHOLE race. Half way through the race, on the other side of Golden Gate Bridge, I was able to pull down my arm sleeves and take off my headband. What a great picture. I love the lone rock in the water. My friend sprinted the last 1/2 of a mile to the point where it was difficult for me to keep up with her. What an accomplishment! I’m so happy for her and glad she chose to spend my birthday morning with me. Here we are, very happy and tired in front of the courthouse. I received a handful of happy birthday wishes today, and even more yesterday when I wore this sign. People were so friendly in Livermore. My new visor is a birthday present from my friend who ran with me and worked out perfectly for the first time wearing it! Orange Mud Race belt – This allows for all sizes of bibs without puckering. Also, I love their hydroquiver. Skirt Sport Skirt – the one with the long pocket down the right side, perfect to hold my chapstick close at hand! A standard money belt that you would take traveling to carry Pro Bar Bolts, money, ID, keys, (chapstick), and tissues. Lucy Run Capris – love that they have reflectives on both sides!!! Injinji toe socks – they just came out with a women’s specific run sock that I can’t wait to try out. Morning Of: Oatmeal with crasins, almonds, brown sugar and cinnamon; 1 cup hot caffeinated tea with splenda. During: 1 package Pro Bar Bolt without caffeine; water; Gatorade at aid station mile 4 and 10. Pre-race Injury: Sore calves and back from the half marathon the day before. Taped: Both knees (1 strip each), hamstrings (2 each), groin (1 each), calves (3 each). During: Calf soreness the entire race. Top of right foot hurt (like shoes were too tight). Post Race: Stretched well after the race (thanks to T). Hung out with NP in Hayes, stretched, stayed mobile then commuted home. Took a ice bath after I got home. Knees were swollen and hurt walking down hills and after sitting for long periods. Hung out in Dolores and kept shifting positions. In the evening, iced knees, calves, and back. Calves stiffened after ice (ice for knees, heat for calves?). Lightly stretched before bed. Day after Half #15 (two days after Half #14): Calves, back, knees were a little stiff in the morning. Sore calves all day long. Knees hurt when going down stairs. Right foot near big toe swollen and hurts when I lift up big toe. Went to PT who massaged calves and said metatarsal is stiff on right foot. She advised to not do any hills for awhile and do easy runs to allow calves time to heal. Strength training is needed for calves. Two days after race #15: Ran slowly for 1/2 mile and walked 1.5 miles. My foot is still hurting and swollen. My calves when warm are not sore. My back still has some soreness. My first 15k. I was surprised by the number of people who were running it because 9.3 miles is not a short distance. There was lots of chocolate at the expo and after the race. Even the medal was in the shape of a chocolate bar. Certainly an experience. My friend and I ran at a pretty fast pace and I was under trained so for the week following my calves were tight and injured. Great weather. Lots of beautiful sites to see. Hilly – 4-5 hills. The bridge was not closed to car traffic, the runners had to run on the sidewalk. I could see me getting a PB on this course because of the challenge of weaving between people on the bridge. Pre-race Injury: right bottom outside lot pain since fast run on Monday. Saw PT on Friday and determined it was an inflamed joint, not plantar fasciitis. Took Advil prior to race start. During: foot hurt a lot before start of race – shoes put pressure on inflamed spot – and I considered not running. Around mile 9 my calves became sore. The bottom outside of my right foot hurt entire time but not as bad as at race start. Post Race: Stretched after the race. wore compression sleeves when I got home. Iced foot and knees and calves. Two days after race: calves more sore than past two days. Did the ski boot walk when I got up in the morning. Foot not as sore, wore sneakers last night and today. 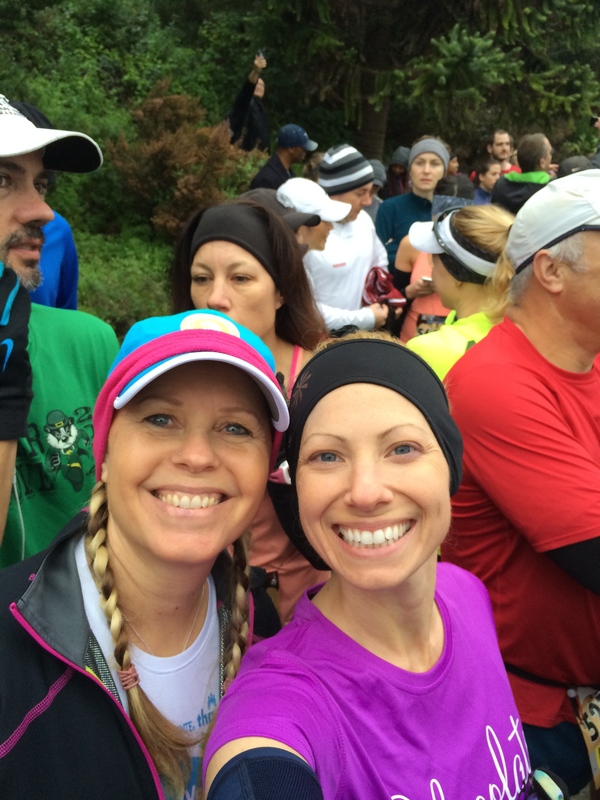 For 2015, this race is now called the Golden Gate Half Series. Run Sat without the group – could do a combo of running Berkeley hills and then going to the kite fest! I’m looking forward to squeezing in the last few events of the summer season, one of them being a San Francisco Rocks Walking Tour – all about geology! Also may get back into doing yoga on a regular basis.